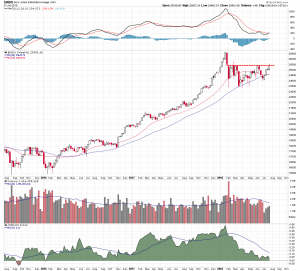 On Thursday it looked like a triple top had formed on the Russell 2000 chart. 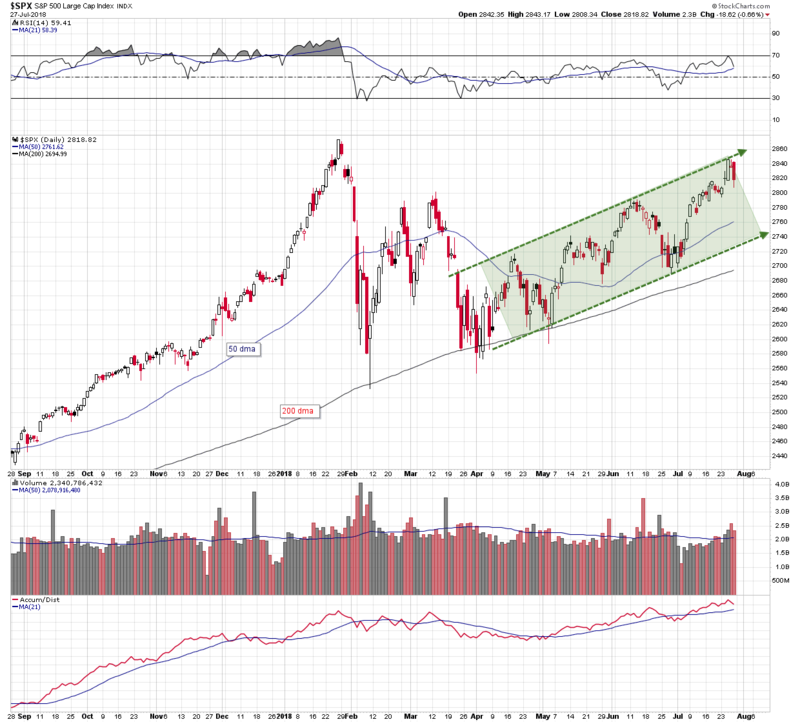 Three consecutive bearish engulfing candles formed at channel resistance and it appeared the consolidation pattern was going to resolve to the downside. The analysis was posted here. 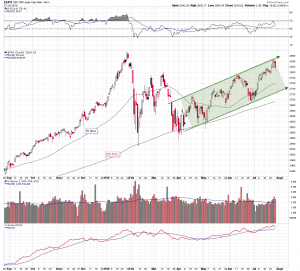 As it turned out the small-caps were hit hard on Friday and the index ended the week below the channel support line. 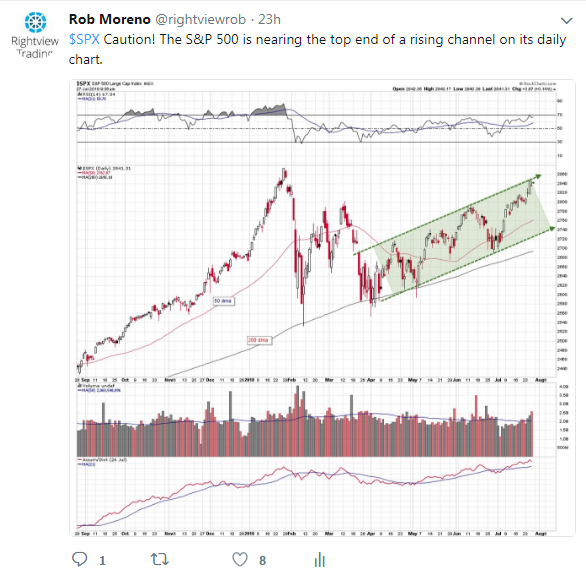 The tweet below was posted on Friday morning and suggested that traders use caution because the S&P 500 index had reached the top end of the rising channel. A pullback at that point in price seemed logical. The S&P did pullback later in the session and a bearish eveningstar reversal pattern formed in the process. An eveningstar is a three-period pattern that consists of a large white candle, followed by a small doji, or opening and closing range candle, and completed by a large dark candle. 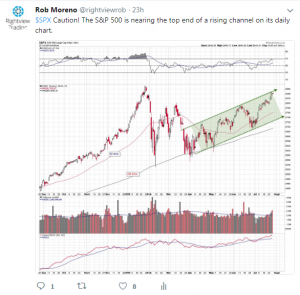 It is often seen at tops after an uptrend, and represents a transition in trader sentiment from bullishness to bearishness. The NASDAQ Composite experienced wide range downside price action in Friday’s session. 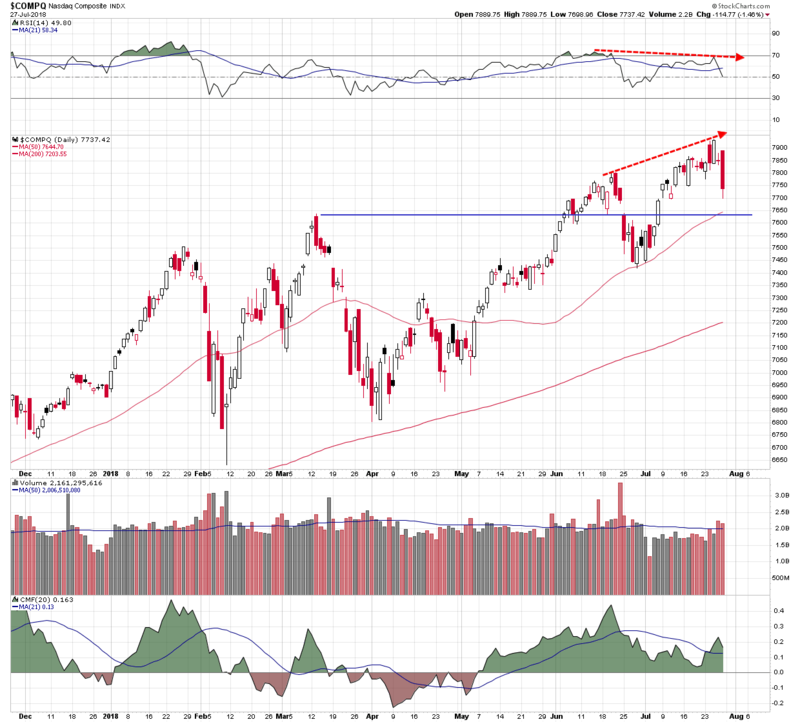 The large dark candle that formed was preceded by a small doji, or opening and closing range candle on Thursday, and a large white candle on Wednesday. This combination of candles formed another bearish eveningstar pattern. On the weekly Dow Jones Industrial Average chart, the index met resistance of its own in the 25,500 area. This as the 20 week moving average is crossing below the 40 week average for the first time since 2016. 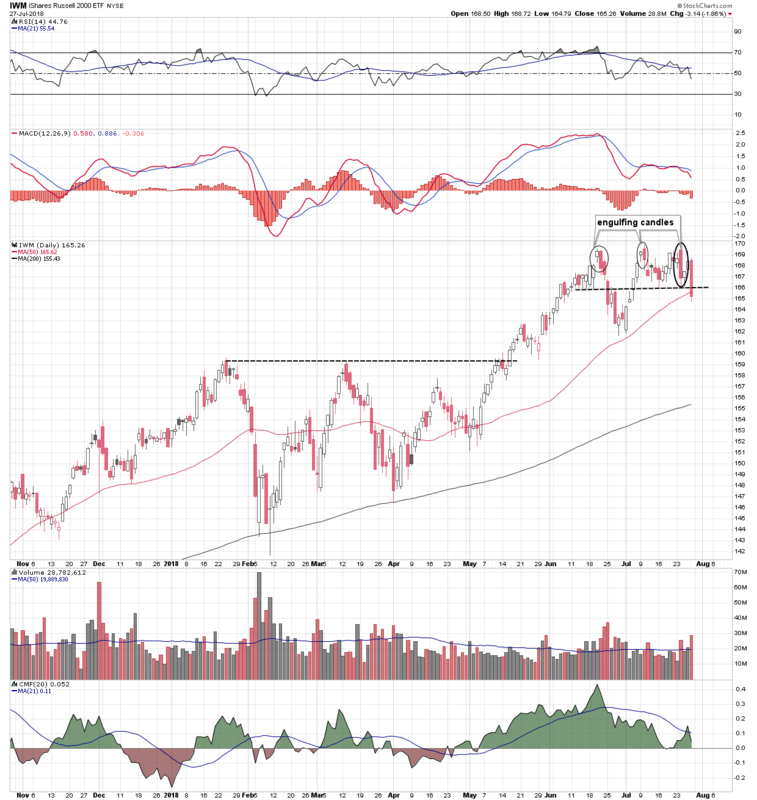 Weekly moving average convergence/divergence (MacD) is making a bullish crossover and the Friday finish on the daily chart (not shown) formed a less bearish candle then those seen on the previous index charts. 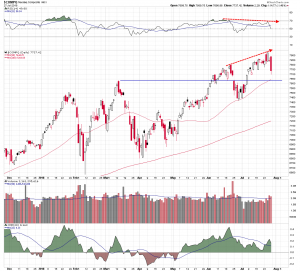 But even with some opposition from the Dow, three of the four major market indices look poised for a potentially substantial pullback. If that proves to be the case, the industrial sector will ultimately succumb to the greater gravitational downside. It is clearly a time for traders to be cautious.